The Glass Tower is touted as the world's tallest building, and its owners are holding a huge gala to celebrate its completion. But the building contractors used cheap wiring to cut corners, against the recommendations of architect Doug Roberts (Paul Newman), and a blaze starts in a janitor's closet. Soon the Glass Tower becomes The Towering Inferno as the fire quickly spreads upward, trapping the party guests. The firefighters can't fight the blaze fast enough and the fire chief (Steve McQueen) devises a daring and dangerous rescue, but not before a slew of spectacularly fiery deaths and heroics. This may sound absurd, but The Towering Inferno had a profound effect on my life. I first saw the movie during its initial theatrical release in 1974, when I was but seven years old. At nearly three hours, this was a rather long movie, but I loved every minute of it and thoroughly embraced the "disaster movie" genre that became so popular. I couldn't get enough of those films. Earthquake, Rollercoaster, The Swarm, The Hindenburg, even a terrible Japanese picture called Tidal Wave - I took in all of them. While I liked most of them, none of them quite equaled the impact of The Towering Inferno. 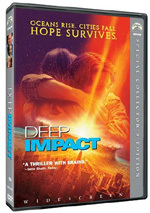 To me, it remained the Holy Grail of disaster movies. While it's hard to remember now, movies had much more of an allure to kids of my generation than they do now just because they were so much more unattainable. Home video existed but was very much in its infancy. The concept of purchasing or renting movies wouldn't become a practical reality until I reached my mid-teens in the early Eighties. As such, if I wanted to see The Towering Inferno again, it was going to have to be on TV, and that occasion never seemed to occur when I was a kid. Since cable wasn't much of a factor, we had to rely on the broadcast networks, and it usually took them a lot longer to get movies than it does now. I was unable to find out through an Internet search exactly when Inferno hit the airwaves, but all I do know is that it was an interminable wait for this little kid. I was so enamored of it that I wanted to buy its soundtrack. I didn't want the music, but for some reason I was convinced it would include all of the film's dialogue. Geez, my fascination with this film actually indirectly caused me to learn how to type! In third grade, we had an assignment to write a story that completed a tale about the Borrowers our teacher read to us. I decided to take them into the big city, where they'd live in a tower - an ill-fated tower, ultimately. I don't know what kind of grade I got on my story, because the project just kept on going. Ultimately, it was more than two years later that I actually finished the thing, and along the way I decided that it would make more sense if I could type it. My handwriting was - and remains - extremely poor and I dislike writing by hand. As such, due to my transcription and then extension of the story I called "Fire!" I learned the unexceptional but quite functional typing skills that serve me to this day. Am I making my point clear? While Inferno hasn't been among my favorite films since the Seventies - once Star Wars hit, I pretty much forgot about it - I can't deny the substantial impact it had upon my life. That's essentially why I've avoided watching it over the years. You know what they say: you can't go home again. I haven't wanted to watch Inferno because I didn't want to ruin my memories. Actually, I think I've only seen it once since I was a kid. When I got my first laserdisc player in 1991, I rented it, and was quite disappointed to see how dull it was. So much for that childhood myth. And I didn't go back for years. Surprisingly, when I gave it another chance, I got a pretty big kick out The Towering Inferno. More than 30 years burning down the road and it still works well. I can't say that it captivates me the way it did when I was seven - and I have no idea what Academy voters were thinking when they gave it one of the five Best Picture nominations for 1974 � it remains a class act and an entertaining film. I can't deny that nostalgia may drive my enjoyment of Inferno to some degree. Just starting the DVD up gave me a bit of a charge as all those memories came rushing back at me. Still, nostalgia alone wouldn't have gotten me through 165 minutes of the movie if it didn't have something going for it. The film's fabulous cast didn't hurt. It was fun to simply see all these folks massed together. You know you have a special group when Fred Astaire only gets fifth billing! No one does much in the way of terrific acting, but it really was enough that they just showed up and worked competently. The blaze leads the way, and everyone else just comes along for the ride. Inferno is one of those "whole is greater than the sum of its parts" films because it doesn't stand up to dissection. As I noted, the acting is decent at best when one separates out the dazzling star power. Director John Guillermin moves things along at a workmanlike but slow pace. Two hours and forty-five minutes was simply too long for this movie, and it probably would have worked better if it lost 20 to 30 minutes. The story is rudimentary and the script simple, as it comes with extremely sketchy and one-dimensional characters. But somehow the piece manages to be effective as a whole. Despite the horrendous logistics of introducing and establishing this giant cast, we learn enough about the characters to get a handle on things and we care about them in a basic way. No, I wasn't terribly emotionally invested in them - there were simply too many participants for us to ever get into any of them - but they weren't the nobodies of more modern disaster films like Volcano and Dante�s Peak. At least most of the personalities in Inferno offered a little spark. Astonishingly, despite its bloated length, Inferno manages to offer quite a lot of suspense and tension. Do I have the slightest idea what it would be like to go through such an ordeal? Well, our house got hit by lightning and caught fire when I was twelve. As the only one home at the time, it freaked me out. Somehow that event doesn't seem to quite match up to the fright involved with being trapped on the 130th floor of a burning building, so no, I can't relate to the experience. I thought that Inferno effectively delivered a sense of the terror and anxiety that would be involved in that sort of calamity. Much of the film depicts the kinds of quiet heroics we expect from this sort of movie, as it's effectively a love letter to fire fighters. Still, we do see a lot of panic and stupidity, and enough characters buy the farm that we're never quite sure who'll make it to the end. Even though I'd seen the movie, I still couldn't recall exactly who would survive. Yeah, it�s a given that some of the actors will endure, but with so many from which to choose, there's a good shot some who would survive in a smaller production won't last until the final reel here. Does The Towering Inferno drag at times? Yes, but surprisingly infrequently. The story really kept me going for most of the film. Around the 100-minute mark I started to lose some interest, but events quickly picked up the pace and I was right back into the flow of things. It's not a fast-paced movie, especially by current standards, but it cranks along at a quick enough rate to keep the viewer interested. One area in which the film excels is its special effects. Despite all of the progress made in this field over the last 30 years, these visuals hold up remarkably well. Yes, a modern production of this material would make the images much more dynamic, but these shots remain tremendously realistic and believable. One or two scenes seem somewhat artificial, but the nighttime setting does a good job of hiding most flaws. Kudos to the effects guys - their talents are much of the reason that Inferno continues to entertain and thrill after all this time. In no way can I call The Towering Inferno a great piece of work. However, it remains a lot of fun and stands as probably the best of the disaster genre. Nostalgia or no, this is an entertaining flick. 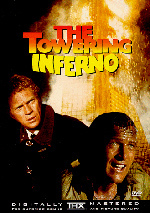 The Towering Inferno appears in an aspect ratio of approximately 2.35:1 on this single-sided, double-layered DVD; the image has not been enhanced for 16X9 televisions. The transfer showed its age via a mix of problems. The biggest issues connected to sharpness. Moderate edge enhancement appeared throughout the movie, and the picture took on a rough, �digital� look at times. This meant softness for many shots � especially wide ones � as well as more than a few instances of jagged edges and shimmering. The movie seemed rather unstable on occasion. At least it lacked substantial source flaws. A few specks and marks appeared, but not much to detract from the experience. Colors were also quite nice. The various hues came across as lively and concise throughout the movie. I saw no concerns in that area, and blacks were also deep and firm. A few low-light shots could be a smidgen dark, but those stayed acceptably smooth for the most part. Really, it was the lack of definition and the digital edgy look that made this transfer mediocre; everything else seemed positive. Despite its age, I found the film's Dolby Digital 5.1 mix to pack a surprisingly strong punch. The forward soundstage provided some nice stereo effects, with decently localized dialogue and some occasional effective panning. This was especially true in the later stages of the movie when we heard more helicopters, explosions and fire vehicles. The rears presented some good ambiance in the way of fire effects and music. The rear speakers didn't get much of a workout, but they added to the presentation in a satisfying manner. Audio quality seemed more than acceptable for a movie from 1974. John Williams' score probably came across best, as the music offered pretty positive range and delineation. Speech lacked notable edginess and sounded reasonably distinctive and concise. Though louder effects suffered from a bit of distortion � particularly during the climax � those elements were usually accurate and relatively precise. High-end bits tended to be slightly harsh but not badly so, and bass was fairly deep. This was a very nice soundtrack for an older film. Not too many extras appear. We get a rather crummy trailer, one which proves that ads that give away films' endings are not a modern invention, so if you haven't already seen Inferno, watch the movie before you view the ad. We also find biographies for ten cast members. While the biographical information on each participant is fairly brief, I was rather impressed by the detail in the filmographies; all of them are tremendously lengthy and appear to present every TV or movie role for each actor through 1999. It ain't much, but it's something! Because my reaction to The Towering Inferno is so strongly tied to my own personal experiences, that makes it somewhat hard for me to make a clear recommendation. Despite my bias, however, I think the movie's pretty exciting and tense and delivers pretty much everything one could want from this sort of film. The DVD offers very good audio but presents lackluster picture quality and no substantial extras. I like Inferno as a movie but don�t think much of this release.